Have you spent thousands on a mattress only to be disappointed by the promises made by the manufacturer? You’re not alone. Buying a mattress is a difficult task at the best of times. But finding the right mattress doesn’t mean you need to throw away thousands of dollars for a good night’s sleep. In fact, choosing the best mattress under 500 is easy with our help. I’ve put together a list of the top 10 best mattresses under $500 and created a handy guide for you to find the one that will help you sleep like a baby. Below, we’ve outlined the 10 best mattresses under $500 and illustrated their strengths, weaknesses, and everything in-between. Perfect Cloud’s medium-firm model, the Supreme, claims to be the best substitute for the hotel bed of your dreams. Using materials from BASF Germany, the bed is responsive enough to accommodate sleepers, no matter their age, weight, or sleeping position. First, they provide a high-quality mattress that won’t damage your health. Both dust mite resistant and hypoallergenic, the bed is also a good choice for those with sensitivities to the material used in other mattresses. You’ll also see better sleep quality because all Perfect Cloud products have a low Volatile Organic Compound (VOC), which means there’s no emissions damage the air quality in your bedroom. One potential drawback with this mattress is that it is firmer than a normal medium. So, if you’re lighter and like softer mattress, you’ll need to look elsewhere. 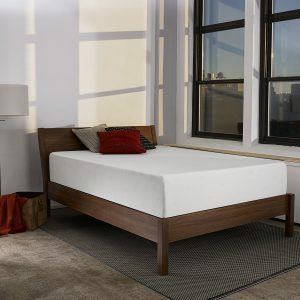 Ultimately, you’ll find it’s a high-quality bed for those who like a little extra firmness but who don’t want to give up the body contouring feel of memory foam. Zinus’s product is a smooth-top mattress with 3 inches of memory foam, 3 inches of comfort foam, and a 6-inch base made from high-density support foam. Although it’s a memory foam mattress, it provides decent support even at the edges. It’s a medium-firm mattress, but it’s also on the softer side of the medium-firm spectrum. Heavier people might find themselves sinking into the mattress a bit more than they’d like. What sets the Zinus mattress apart, and makes it one of the best mattresses under 500, is the green tea oil infused into the mattress. The green tea extract is used with castor seed oil as a way of warding off bacteria and odors caused by bacteria. 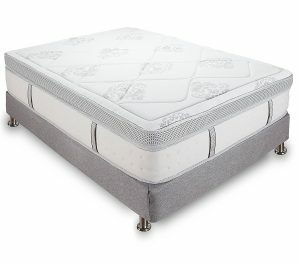 While the Zinus mattress has some unique properties, some customers have complained about the lack of edge support. In some cases, for some customers, the edges are a full inch shorter than the middle. Some also think that the mattress is harder than they would prefer, but this is also a personal preference. The Zinus mattress offers something unique to its competitors. The added oils designed to keep your sleeping area healthy are a big benefit, but if you’re looking for a mattress that falls on the firmer spectrum medium-firm, this isn’t the mattress for you. 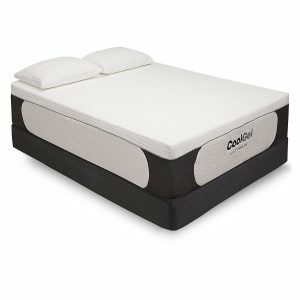 The Classic Brand Cool Gel Ultimate mattress is one of the best mattresses under 500 because it offers something unique compared to other mattresses in this price range: gel infused ventilated memory foam. 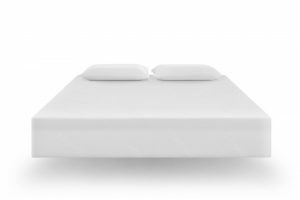 While memory foam is becoming an industry standard, the addition of the gel creates a memory foam experience that is cooler than other mattresses. The gel encourages air to flow through the mattress, which prevents you from becoming too hot. Gel also recovers faster than traditional memory foam. 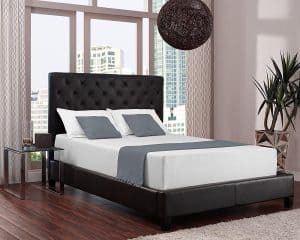 The mattress offers a 14-inch profile with 2 inches of cool gel foam, 2 inches of memory foam, 2 inches of comfort foam, and 8 inches of base foam. The only real drawback for this mattress are the free pillows – they’re sometimes hard to find and often a bit lumpy. Some customers have also noted that the bed can be soft for the first few days, but it gets firmer over the first week of use. So, those who need immediate firm support may either need to wait it out or go elsewhere. Classics Brands have designed a mattress for hot sleepers. 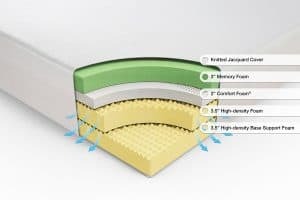 While it’s heavier than other mattresses, the benefits of the gel infused into the material outweigh the difficulty in maneuvering the mattress. Here’s a second mattress for those who are looking for a cooler sleeping experience. 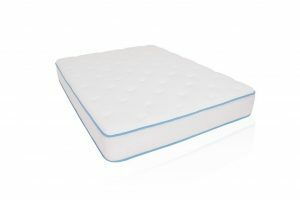 The memory foam used in the Artic Dreams model differs from traditional memory foam because it’s more open than the conventional product, which is ideal for those who are hot sleepers. The mattress takes a while to settle. It doesn’t have the slow recovery that many memory foam mattresses do. You might need to give it a few nights or even a few weeks of sleep for it to reach the shape or firmness you like. But not to worry, it molds to your body without leaving the dents found in some cheaper versions of memory foam. The Arctic Dreams mattress is also an ultra-plush model advertised as a medium-firm mattress, which means it might be firmer than some might like. Now, cooling technology is included in the Arctic Dreams mattress. But, customers say it’s still hot for those who are already hot sleepers. This mattress also has the softness issue. You may need to sleep on it for a few days and wait for it to firm up. This mattress is great for those who are looking for a firmer mattress (but not too firm) and who sleep warm (but not hot). Buying a box spring to keep it firm over a longer period might drive the total cost up, but it’s still one of the best mattresses under 500. Here’s another 14-inch mattress with gel-infused memory foam designed to prevent the buildup of heat that accompanies most memory foam. The Gramercy model has something other mattresses don’t: wrapped innerspring coils. While the memory foam itself stops the transfer of motion, the coils take it one step further. Though, the coils add to the softness. So, it’s ideal for those who are looking for a mattress on the medium end of the medium-firm spectrum. Design is also a key feature on this mattress. Unlike several of the other best mattresses under 500, Classic Brands spent time creating a knit cover with details that keep your mattress looking lovely even after you’ve stripped your bed. Classic Brands advertises this mattress with a box spring. And here’s the downside: you’ll want to buy one. Because some customers suggest the mattress begins to sink over time. You’ll also want to buy new deep pocket sheets for this model, because normal fitted sheets slide right off a 14-inch mattress. This mattress is for those looking for a medium when buying a medium-firm mattress. It’s also great for those who have extendable bed frames because the coils keep the memory foam from sinking. Signature Sleep offers a firm mattress that is one of the best mattresses under 500. Unlike other mattresses, it can be used on multiple surfaces, as long as the frame meets the dimensions of the mattress. This is one for those who are looking for standard memory foam on their mattress, but who are otherwise aren’t fussed about responsiveness. The Signature Sleep mattress is a firm model, and you’ll likely find it’s firmer than you thought it might be. So, invest only if you’re certain you’re after a firm bed. If you’re looking for a firm mattress that offers plenty of firm comfort, here’s your model. However, if the warranty is any indication, it’s not one to purchase for full-time use. The Best Price Mattress is another standard memory foam mattress. Though, it does include active charcoal to deal with excess moisture and odor that accompanies a mattress. The cover on the mattress is also a natural bamboo/poly blend, which should also help with odor. Ironically, this mattress has an odor when it’s first unpacked. It can take a few days or a few weeks to get rid of depending on the ventilation in your room. It’s also a solid medium-firm, so if you’re looking for the Goldilocks ‘not too hard, not too soft’ mattress, this is it. 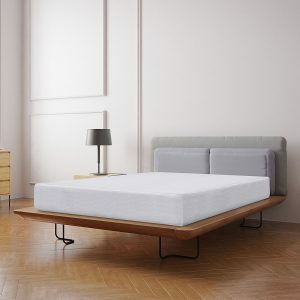 While it’s a medium-firm mattress, this mattress is reportedly better for back and side sleepers, and it should be avoided by stomach sleepers. The edge support on this model also leaves something to be desired. Overall, if you’re looking for a memory foam mattress for a new apartment, a camper, or a guest room, you can’t go wrong. Although production quality can vary, be sure to return it quickly if you think you got a dud. Here’s another gel-model. At 10 inches, it includes four layers that create a medium-firm feel. Though, you’ll need a base for it. The Dynasty mattress includes infused gel beads sewn into the memory foam. It’s the beads that improve pressure relief and promote airflow to prevent the memory foam from becoming too stuffy. This is another great mattress for use in campers, and its medium firm touch is spot on. So, the mattress isn’t one to buy for those who are trying to recover from an injury. If you own a Sleep Number, it is equal to roughly a 70 firmness. Its firmness is also a drawback for some potential buyers. Firmness is a subjective thing, but sometimes this medium-firm mattress can be too firm at first for some people. So, keep this in mind if a firm bed isn’t something you can work with. If you’re looking for a standard medium-firm with an extra cooling method, this model may work for you. Use it with a base if you intend to sleep on it full time. Sleep Innovations offers a mattress for those who want a medium feel but whose body size may put them off buying one. This mattress considers comfort throughout the whole design. It includes a bottom support layer with foam as well as the memory foam layer on top. The Shiloh is also ideal for all sleep positions as well as those who toss and turn all night. The mattress temperature is neutral because the Shiloh doesn’t include the cooling gel. So, it’s good for those deep sleepers who aren’t hot all night. 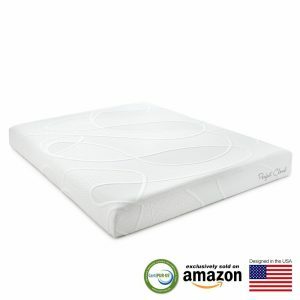 Sleep Innovations makes their mattresses in the United States, which is great for fast shipping. However, one disadvantage is that there’s no washable cover on it. You’ll want to lay down a secondary cover if you want to protect the mattress. If you’re looking for a mattress comparable to the Tuft and Needle brand, but want to save some extra money, Sleep Innovations offers a good alternative. Also, the edge support is a rare find on models in this price range, which is a big bonus for some. Unlike every other mattress on this review, the Tuft and Needle Mattress is not a memory foam mattress. Instead, it uses Adaptive Foam, which leaves behind latex and other traditional materials that often trap heat and lead to the sinking feeling. It also includes gel and graphite to cool the foam down. The Adaptive Foam prevents you from disturbing your partner. Back, side and stomach sleepers are also accommodated for. One of best offers is the full refund guarantee offered by the manufacturer. If you don’t love it after 100 nights, you can send it back. 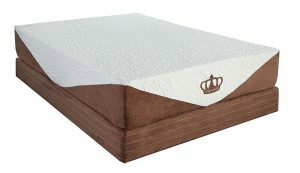 The primary downside with the Tuft and Needle mattress is the edge support. There’s virtually no support for sleeping on the edge of the bed. Some may even find it difficult to sit on the edges. It may also take a few weeks to full break it in. Made and manufactured in the U.S.
Here’s a mattress designed to address what most customers want: the chance to try and buy without paying thousands of dollars. Their customer service combined with the quality of the mattress suggests that if you’re looking to try one of the best mattresses under 500 without the commitment, go with Tuft and Needle. Buying a mattress is an incredibly personal and important decision, so it’s impossible to choose a ‘winner’ for this roundup. What creates sweet dreams for you might result in back pain for others. But these are 10 of the best mattresses under 500, and each of them merits your consideration. So, take your time, nail down what you’re looking for, and always check the warranty.